Troy is a vibrant business and technology center, home to over 6,100 thriving businesses—everything from high tech to high finance—that employ 125,000 people. Many companies are headquartered or have key offices and facilities in Troy. In 2011, Troy was ranked the safest city in Michigan, as well as the 19th safest city in the nation. The city is renowned for its beautiful neighborhoods, award-winning school district and world-class shopping, dining and entertainment. 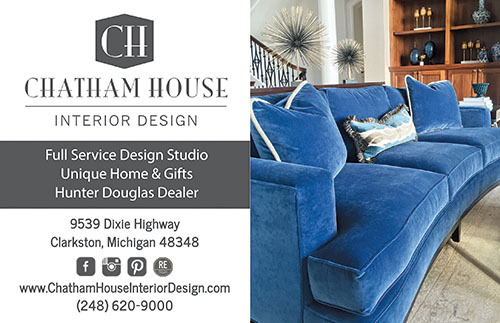 At Chatham House Interior Design, we offer a variety of design services in the Troy area, including full home construction design, custom furniture, window treatments, Hunter Douglas products, and more. Whether designing residential or commercial spaces, Chatham House has built a reputation of achieving highly individualized results for our discriminating clientele. The history and location of the project, and our firm belief that successful design must be generated by the individual characteristics of each project, inspire us to create extraordinary interiors. We believe design should inspire you, soothe you, energize you, tickle your funny bone, wrap you up and connect you to all the things you love. Guided by our clients’ aspirations and diverse experiences, we design interiors that allow our clients to fully express who they are and what holds meaning to them. Our design team has the vision to guide you in selecting the look that fits your style and your personality. Combining quality products and professional creativity, Chatham House ensures that even your most playful selection is a sound investment and a great source of self-expression. We create visual stories that become personal surroundings.